We have very reasonable and comfortable public bus running in major resort and shopping area in Bali. Kurakura(means Turtle in Indonesian)Bus stop is just a second away from our Surf School, and we also sell tickets here in the shop. If you prefer much safer way to travel busy area in Bali, than riding bikes, hitch hiking, or getting ripped off by shady taxi drivers, this is definitely the best transportation available. 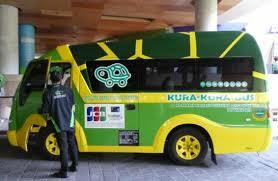 Kurakura bus even offers free Wifi in the vehicle… For further details for Kurakura Bus, below is their website. There are many shops, hotels, activities surrounding our surf school on Kuta Beach. 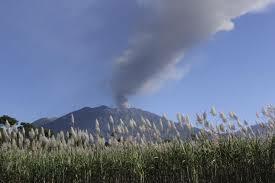 Bali has mainly 2 seasons which are Dry season(April-September), and Wet season(October-March). In Dry season, the sea turtle conservation facility in Kuta Beach releases baby sea turtles back into the habitat everyday around 4~5pm. 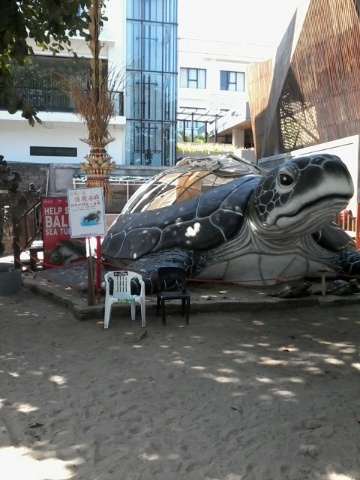 If you are interested in seeing newly born baby turtles on visit to Kuta beach, you can stop by this big sea turtle shaped dorm at the back of our surf school at sunset time. Since last week, Mt.Raung located in East of Java Island(neighbor Island to Bali) started to erupt and surrounding airport were closed down. Bali International airport was reopened yesterday afternoon, but closed down again this morning. Here are some links for news regarding the eruption. 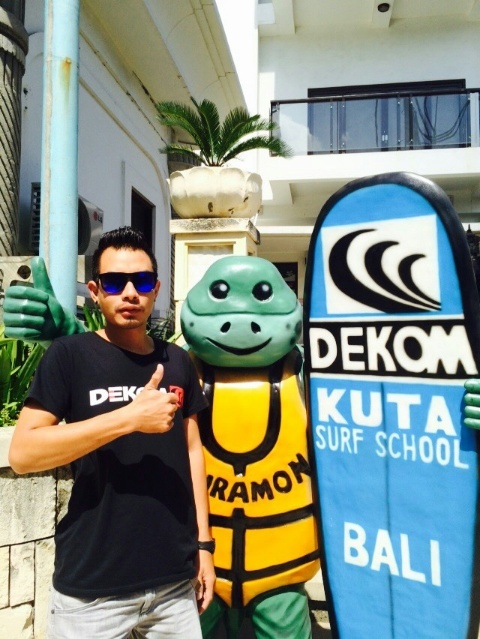 Activities in Kuta Beach remains the same and our surf school is operating as usual. We are open for upcoming Galungan days as well. Stop by if you are in or be able to enter Bali. We are looking forward to see you here! Birthday here in Dekom Bali Surf School is bit different then in other other places. In general, birthdays in Indonesia is different. Yesterday, our lucky staff had a birthday. Here birthday person has to treat others not other way around as many of us know. Many people try to hide their birthday since they refuse to have to treat others. Our lucky birthday boy was kind enough to treat us with candies. He works hard everyday and drive safe around traffic jammed Kuta area with great patience. He doesn’t need any more stress. I pity him for asking to treat us with something, so I gave him a bread with a birthday candle stack in the middle… So here is little warning for whom does not know the birthday custom in Indonesia, your birthday party is on yourself.